I’m thrilled to announce the imminent publication of my first book (and, if nobody buys it, my last book). 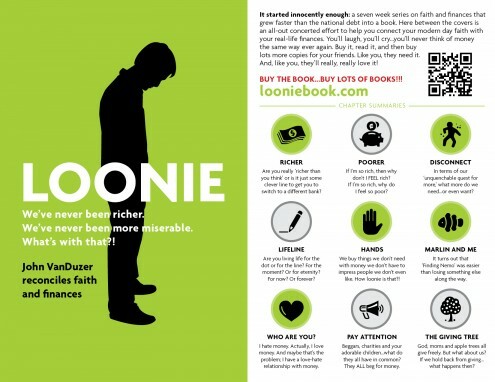 Called “LOONIE: Crazy Talk about Faith and Finances,” the book explores our attitudes about money from a faith perspective. In particular, it explores not only the reasons we make charitable contributions but also why we hold back. It’ll be out in the next couple of months and you’re welcome to sign up to reserve your copy so that you get it hot off the press. Go to www.looniebook.com for more information and to get on the list. Soon you can purchase the book directly from the site. The book is approximately 230 pages and sells for $20. Buy lots!! !